You may already be familiar with searching for articles and other academic works in the popular web search engine Google Scholar. You may have noticed the article-level metrics such as number of times cited (and by whom) that are included with your Google Scholar search results; perhaps you have even made use of the browse-able lists of journals ranked by citation impact. There is another useful feature of this freely accessible online tool worth exploring, and that is the Google Scholar Profile. To start your Google Scholar Profile you’ll need a free Google or Gmail account, and a few minutes. You can include a photo, your research interests and institutional affiliations, and you will have the chance to fine-tune your profile and citations list after set-up. Because your citations are gathered using Google’s proprietary algorithm there is some care and feeding involved, in terms of removing duplicate citations or incorrect matches. But Google Scholar makes these types of edits relatively easy, and you can get notified when there are new citations to review before they are added to your public profile. The more works you make available online, the easier it is to populate your Profile with citations. Taking this a step further, the more works you make open access, the easier it is for the public to actually read your works! Have questions about whether or not you can post a work? Interested in learning more about copyright? We’re here for you! 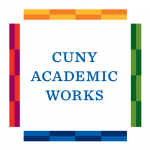 CUNY Academic Works has an Author Dashboard that shows you how much your works have been downloaded and from where! By design, Academic Works increases the discoverability of your work in Google and Google Scholar. As you can see, scholarship in Academic Works is being downloaded and read all over the globe. For more information about our institutional repository please visit the Academic Works libguide. Together, these two free tools complement each other, giving you different views of your research impact (more traditional metrics in Google Scholar, altmetrics like number of downloads in Academic Works), and amplifying not only the discoverability of your work but also your readers’ ability to access the full text. Adriana Palmer works in the Collections Department at the GC Library.